We have had some very good feedback, especially on the Southam Facebook pages. Many people said how much they enjoyed the market and the quality of the produce and the friendly community atmosphere. We had reports of visitors coming from quite a long way away to visit the market, and it worked very well having the market on a Sunday when people had more leisure time. Our local museum was open in the morning, and they had more visitors than ever before, so that was very pleasing for them too. Next time we hope to persuade more cafés in Southam to open. We have 5 cafés but only one was open, and unfortunately they closed early. The Southam First committee will be meeting in May, and we will discuss when to invite you back again. Please thank all the traders on our behalf, they were all extremely professional, friendly and courteous, and there was no litter left behind afterwards. "A great market. Really surprised. I spent far too much money!" The strawberries were "very expensive - as were the peaches but they were fantastic - as were the apricots.The cheese counter was the best." I would like to say they were the best market I have worked with; everyone was so friendly, polite and helpful and the products were all excellent quality – they were a total pleasure to have in Lowestoft. Thank you once again for all your help and I look forward to hearing the feedback. The French market from Dieppe comes to see us in Seaford twice a year - and they came last Friday.I am myself very impressed by that market and with what they sell, which is all authentically French, like real French cheeses made in France, mouthwatering cakes like tartes aux fraises, aux pommes with and without cream, flans and all sorts of other cakes, tartes tatin, baguettes, croissants and petits pains au chocolate; all hot and fresh, made and cooked on the spot. They bring all their ovens. Sausissons secs of all kinds, jambon fumés, rillettes de porcs, pâtés de foie gras and all sorts of other patés. Biscuits of all regions of France. Fresh, cooked food like grosses crevettes à l'ail and gratins dauphinois.The fruit stall was incredible. The peaches were sweet and melting in your mouth and the cherries were the real sweet black cherries that I love so much. Smoked and non smoked garlic and French shallots were also on display, as well as the sweet melons of Canteloupe. They also bring a stall of scarves from Paris and baskets and hats made in France, French second hand books and French CDs. It is a beautifully run small country market full of French charm and lively atmosphere, which is a great joy. As well as the usual French product of wine, bread and cheese, it offers a numbers of other delightful goods including clothing, handbags and tablecloths to name but a few. The stall holders are of course completely bilingual but is is nice to say a few words in French to make feel you are truly in France. I am very pleased that you found your weekend in Tetbury a success, we certainly did. We have had many complimentary comments about your Market and how it improved the overall standard of the Woolsack Street Fair. Thanks for reserving the Woolsack Weekend for 2011, we shall certainly look forward to another successful event, and in the meantime have a good summer and see you in Tetbury in October. It was great to work with you Muriel and France at Home brought joy to many shoppers and workers in Huntingdon! Hi Muriel, please take a look at the photo album using images taken last Sunday. I think you'll like it! The images are courtesy of Sarah Dawson, a Staplehurst resident whose website http://www.kentscape.co.uk/ is well worth a view. Thanks to you and your team for all your efforts this weekend. Your market was very well presented and authentic and all your traders were friendly, hard-working and courteous. Our staff who worked the event were impressed by their demeanour and professionalism and wanted to make you aware of that. Thanks also to you for a very professional job in the build up. We build up good relationships with people in the towns we visit. We have been to Chorleywood in Hertfordshire three times and the whole village gets into the French spirit with us. They fly the Tricolore flags weeks before the event and on the day local musicians and painters, including a pavement artist, come out and join in to add their own French flavour. One year they even set up a boules tournament in their local supermarket delivery bay with a nailbiting final being held between the local pub and the church. A local farmer had to transport the gravel and distribute it from the back of his tipper truck. This year the community magazine, Chorleywood Magazine, organised for their young video team to make a short film of the activities. Enjoy! It is a beautifully run small country market full of French charm and lively atmosphere, which is a great joy. As well as the usual French product of bread and cheese, it offers a numbers of other delightful goods including clothing, handbags and tablecloths to name but a few. I have been receiving great feedback all week about how much people enjoyed the market on Saturday. A number of businesses have told me they noticed more people on the streets and that there was a really good buzz on the day. I have already been asked several times when you will be returning to Midhurst. Businesses would love it if you could come twice a year and have asked if there is any chance at Christmas ! Hello and thank you so much for everything you did to contribute to the success of the East Preston Christmas Celebrations. I have only received positive comments about the French market, and everyone left The Street very clean afterwards. I hope your team all found it worthwhile coming here. Glad to hear that you got home safely and that your traders gave you a positive feedback on Cricklewood. I have been receiving congratulatory messages from residents and they are looking forward to your return. Thank you for your email – it was a great to see you again and a pleasure to work with you. 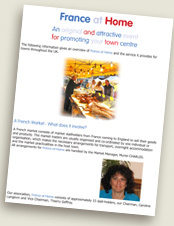 My Councillors commented on what a great French Market it was – so please pass this on to your traders! I am happy to pencil in the same weekend for 2017. Just a short note to thank all your stall holders for putting on such a superb market yesterday. There was a fantastic atmosphere, and together with the exotic Italian super cars, the whole event was just outstanding. Of course enjoying some glorious sunshine was just the most wonderful icing on the cake ! There must have been a crowd of over 1,000 people at one stage of the day, so hopefully the Market will have enjoyed some good business. The traders bring everything they need with them including generators but if they can have electrical hook ups it means you can avoid the noise of the generators. All of the traders are genuinely French and the bakers, meat, cheese and hot food stalls are particularly popular. Muriel is lovely to deal with and her English is perfect, she can also advise on set up etc. I am so glad that the market was a success for you. We have had lots of lovely feedback on facebook and one of the town centre businesses emailed in to say that he benefitted from the added footfall too. We will be delighted to have you all back next year. A big thank you for organising the market traders to come to Rickmansworth yesterday. The event was a great success and, subject to finding others to help (I slept for 13 hours last night! ), we would like to do it again next year. Please thank the bread man for keeping me fed. That was a great benefit, being on duty for 13 hours took it's toll. The number of people attending was far more than I expected - it shows that our publicity is working. Comments from the local shops and from visitors to the event made it all worthwhile. The local shops recorded a record footfall as well and so many people made very positive comments about the day.Face Book is full of them as well. Well, as I have said, the day was a huge success - thank you.